On Monday, 2 February, Alf Gundersen's family and friends gathered at St John’s Church to celebrate his life. Habiba brought a haiku and Ralph Vaughan William’s Ascent of the Lark, Sam and Yvonne in Los Angeles sent a tribute, Georgia brought her eulogy, Jo and granddaughter Sarah, a candle, which symbolised the life Alf shared with his family. The flickering flame, soaring music, and white flowers spoke volumes and the poetry, tribute and eulogy made this a deeply moving occasion, a fine tribute to an exceptional man. 'In the sentimental rendition of the words, Alf Gundersen was neither a nice man nor a good man. Indeed Alf despised sentimentality. He was a wise man who never preached his wisdom. He was also a man who possessed true wit, which was not only funny, but insightful. To my sister Josephine, and my brother Sam and me, and to his most-loved Habiba, Alf was a generous man - in praise, which is the first test of generosity, and materially. We were granted our every wish, while he was often unable to afford his golf membership. He was not the best-friend variety of father. He was in fact difficult to talk to. He was rather a presence to be heard and observed. And how wonderful it was to witness the process on paper or canvas unfolding before our eyes! And then there were those apt cards that he made for each of us, which never failed to touch our hearts. I often think back to when I was a child, seeing him sit alone, listening to The Goon Show or Hancock’s Half Hour, slapping his knee with delight and laughing quietly. “Great stuff!” he would tell himself. Alf was a modern man, who always appreciated and praised talent in others. Jazz was part of this appreciation, and we would have to listen to all the greats, played very loud! In variance to this, the breadths of his Constable skies, belie this modernity. Nevertheless he remained a man, as much in love with the past’s craftsmanship and elegance, as with the present’s gusto. Alf was a shy and private man who avoided confrontation, who considered any open display as being unseemly. An only and lonely child who remained that way; who drew for the occupation of it, long after he had mastered the exercises that forced him, in the thinking of the time, to switch from his left to his right hand. Alf Gundersen was not my birth father, but he was, most assuredly, my father. He gave me his name and imparted to me, I hope, some of his insight. Not a day goes by that I don’t find myself thinking in or quoting his words. He and my mother met and married when I was small. Habiba had a Siamese cat which she would walk on a leash along the Hillbrow sidewalks. One day there was a knock at the door and there he stood. 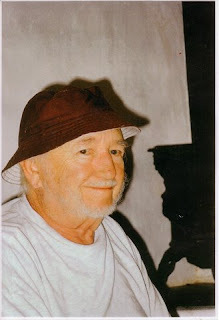 He removed his cap - he always wore a cap in those days - and said to my mother: “I’ve come to see the cat”. Alf was a prolific artist who had no understanding for artists who sat waiting for inspiration. Work, for him, realised inspiration. As for the indulgence of meaning in art he had no such vanity. He was an art for art’s sake adherent. It was rather for the purity of a seamless technique and a threadbare delicacy that he strove; where the subject and the choice of it, are the chief protagonists. His bent was to paint the unworded frailty of both the object and its surroundings, beautifully. On one of my infrequent visits, after he and my mother moved to Prince Albert, I accompanied him on a morning walk. He pointed out the hard edge of the Karoo horizon against the pale sky. “Ah,” he said in his wistful way of speaking, “if I could only paint that.” “But you do Dad,” I said. And of course he did. There was nothing in Alf’s work that was fudged or ill-defined. Nothing that was unresolved or overworked; nothing overblown or distasteful. His paintings of the Karoo transcend the sameness, to an exalted locus where bleakness and the feeling that it imparts, becomes transport. Alf and Habiba Gundersen moved to Prince Albert in 1992. Gundersen trained at the Natal Technical College from 1942-1945. He enjoyed a career in advertising until 1982, when he retired to paint full-time. From his first solo show at the Gainsborough Gallery in 1962 to 2005 at the Prince Albert Gallery, the exceptional quality of his paintings was widely recognised. His paintings are held in private and corporate collections abroad and across South Africa. Additional contributions by Ailsa Tudhope and Mary Anne Botha.